Each month we spotlight a teen at CPL. Kalice interned at the Austin Branch for the Summer Learning Challenge this year, and she assisted children’s librarian Latrice with programs, community outreach, displays and much more. Read on to learn about her experience over the summer. Q: What did you enjoy the most about working in the library for the summer? A: Creating the puppet show. I did not expect to do a puppet show, but I just came up with the idea. 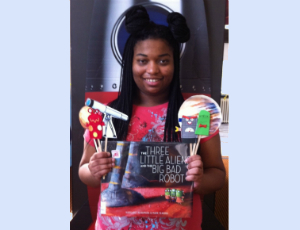 I used the book The Three Little Aliens and the Big Bad Robot by Margaret McNamara. I made the theater and all of the puppets from the characters in the story. I like to make people laugh, so I really wanted people to come to the show and like it. Even though I had to go out of my comfort zone and was nervous, it wasn’t that bad. It was a really good experience! Q: How did the kids like the show? A: The kids liked the energy and the rhyming songs. They were curious about who was behind the curtain. They were comfortable with me, hugged me, and gave me high fives at the end of the puppet show, which felt like a big reward. After the show, we made aliens out of paper. The kids liked to talk a lot and show off the stuff they made. Q: How was your experience overall at the library? A: Everyone was friendly and generous, and I learned a lot at the library. Programs are cool and I liked that we got to visit a daycare for story time. I think this is a pretty hard working library that does not get a lot of recognition. Tell everyone to come to Austin. I used to come here when I was little. People are still friendly and kind and still willing to give you guidance. Q: What kinds of books do you like to read and what are you reading now? A: Big books that have lots of characters and adventures so you have a long time to read them and then you don’t want them to end. I like love stories, unique stories, Greek mythology and Chinese ancient culture. I like when ancient culture gets mixed up with modern culture. I'm currently reading Daughter of Smoke & Bone by Laini Taylor and The Strange & Beautiful Sorrows of Ava Lavender by Leslye Walton. Thanks for all your help Kalice! We hope you have a good start to the new school year and we look forward to seeing you soon!